Some people just don’t understand Americans. Look, if we believe it, it must be so. Harper’s just noted that despite all the gloomy press about recession, 55% of us Yanks believe our homes are still rising in value. That’s right! It’s too bad those guys at Bear Stearns lost their shirts by hyper-leveraging derivative instruments created in brimstone by dark computers based on a home loan some guy in a shiny suit sold to people with FICO scores in the 300s who didn’t need to authorize their income and whom you wouldn’t let baby-sit your kid. Whatever. Our house is rising in value. Former Federal Reserve governor Laurence Meyer just told NPR that no one could see that crash coming. Of course not! Our house is rising in value. Now, The Economist has a piece claiming that Facebook and MySpace are vastly overvalued because they can’t really monetize their user base, and goes so far as to compare AOL’s recent snap up of the Bebo social net to Microsoft buying Hotmail a decade ago. Sure, The Economist says, back in the day web-based email was lauded as an incredible communication innovation, but no one really made a buck by advertising on it. And, to really throw cold water on us, The Economist suggests that all these social media will eventually morph into one big, ubiquitous feature of life. Just like that Charlene Li over at Forrester. Come on, Economist. Does it matter if Beacon bombed, or if you can’t monetize widgets that toss sheep, or if social media users have changed modalities and block out advertising? Does it matter if people soon control their own online social network without 25 passwords? Those are details. We need a hot new thing. We need to believe. We need our home to rise in value. And besides, that Bebo has a really cool URL. 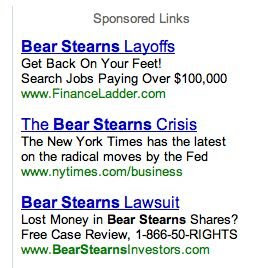 Lost your job at Bear Stearns? Check Google. Those pay-per-click competitors don’t waste any time.